We are glad you stopped by. Be sure to check back frequently as this website is updated regularly. 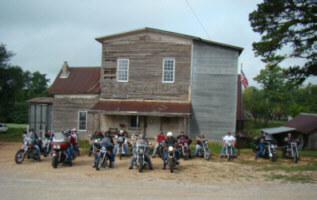 The Summersville Mill was awarded 4th in its category in the state for 2009. The plaque hangs at city hall for all to see. 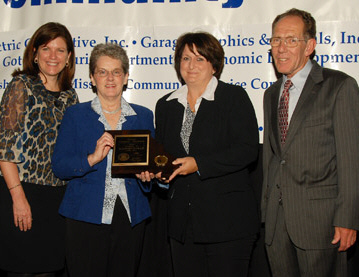 Brenda Wilcox and Charlotte Siedsma went to Jefferson City to accept the award! Thirty nine communities and 18 individuals were honored at the Missouri Community Betterment (MCB) conference in Jefferson City. The Awards Banquet was the highlight of the 46th conference which assists communities to improve their quality of life. Nearly 350 volunteers, community leaders and youth from across the state were in attendance. Area organizers planned a "Dogs off the Leash" poker run on Saturday, September 20 to benefit the restoration of the Summersville Mill. The poker run included a road trip down 106 to Eminence, Highway 19 North to KK, then to Akers Ferry, up K through Jadwin to E, then 119 to Montauk State Park and VV back to 137 through Raymondville to Yukon and Highway 17 back to Summersville. Bikers could sign up to complete the approximately 100 mile run until noon. After a very foggy start to the day, riders began trickling in. A total of 47 bikes and riders completed the ride. Proceeds from donations, 80% of Poker run monies, delicious bar-b-que pork sandwich meal, and raffle tickets totaled $1225.32. At the end of the day, entertainment was provided by Gary Coffee and Southern Core. The first place winner, Karl Welschmeyer, Linn, MO who donated $100 of his winnings back to the mill restoration. Second best hand was won by Cory Brawley, Summersvlle, and the worst hand was drawn by Bobby Burns, Hartshorn. David Oliver of Oliver’s Ozarks from KOLR, channel 10, Springfield, came to Summersville on Friday, July 18 to film a story about the Summersville Mill Restoration. RABS member, Roy Broce, talks with Oliver and crew about the mill progress. The film clip aired at 10 PM Tuesday, July 22. The newsclip can also be viewed at ozarksfirst.com or by following this link.